I picked this book out again for Tristan, the 13-year-old, to read but the blurb inside the front cover had me. I finished it in the middle of the night on Sunday because I am suffering from some serious insomnia not because I was so gripped by the story. Again I liked the book but the front cover gave me a different impression or else how I read the blurb gave me a different impression, I'm really not sure (lack of sleep). I thought the book was going to be a bike ride then swing ahead into the later future where Chris discovers some amazing tale about what happened to his friend, which I guess would have been slightly more fantastical and cool. Instead it goes from bike trip to first week of college-still good. As it is Chris and Winston, two high school friends, set out on a long distance bike trek from West Virginia to Seattle, Washington. The tales along the way are interesting, their friendship is expressed in back-and-forth chapters between past, present and trip. The difference in boys is Chris comes from a loving, supportive family and Winston, a wealthy, cold family with a controlling father and vacation-happy mom. Chris becomes disenchanted with Winston and his antics and lack of responsibility and their relationship spirals out of control. The rest you will have to read yourself. One interesting fault that I had with the book was why Jennifer Bradbury had them ride so far north. She has them trek from Ohio, Indiana and Illinois up through Wisconsin and Minnesota, making note of a stop to see a statue of Paul Bunyon and his blue ox, Babe!! As a Midwest girl I kept thinking "why are they going straight north out of Iowa"- instead of cutting nw through South Dakota. Just me being a picky reader, knowing the lay of the map land way too much or very sleep-deprived. 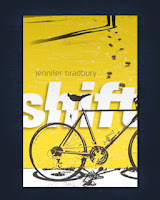 Bradbury does have a great website/blog and I enjoyed her story of how the book came to be. Also the ending (not a spoiler) to Winston's tale is hmmm...I guess I really can't say without spoiling so never mind. Suffice it to stay Winston's character grew on me.